Federation Chairman David Barrett welcomed 32 people, representing 10 clubs, to the NWFCC Autumn Meeting at Culcheth last Saturday. He also thanked all the Officers and Coaches who have worked hard to make the 2009 a success. Treasurer Peter Wilson presented the audited accounts showing the Federation has a healthy balance of over £3,500. Concern was expressed about the change in Development Grant Procedures adopted by the CA this year which has reduced the expected allocation to the North West. Development Officer Janet Davies described the financial support given to clubs this year – Storage Shed at Southport; Lawn Mower at Penrith; Lawn levelling at Bury; Electricity supply at Chester. 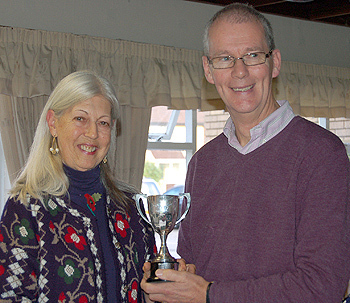 Coaching Officer, Bob Burnett described the coaching activities during the year which has covered all levels of play, all croquet formats and at many locations. He thanked all the coaches and handed the role over to Ken Cooper. There followed a discussion on whether the Federation should charge members for coaching which was resolved by a majority vote that we should continue to offer free coaching. League Manager, Tony Thomas, reported on a successful season involving 134 league matches and thanked all the team captains for efficiency in completing all fixtures and reporting results. The changes to the league rules agreed last year were all implemented without any major problems. There was a discussion on changes for season 2010 and it was agreed: (a) to continue with the Bonus Points system in the Advanced League, (b) to place time limits of 2.5 hours on Advanced Games, (c) allow captains to agree earlier start times than 10:00 if appropriate and recommend a 9:30 start in Advance Matches. These changes to be incorporated in the League Rules, available on the Fed website. It was also agreed Llanfairfechan could play their Golf League matches as ‘Singles Only’ when playing Away but ‘Singles and Doubles’ when playing at Home. A new Disciplinary Procedure was agreed and this to be published on the Fed website. It was accepted this was a sensible procedure to adopt, so that Officers knew how to handle the very rare but potentially difficult situations that can occur. The highlights from the Club Reports included: (a) Bowdon – 94 playing members, new Mentor programme, Groundsman appointed, Winter croquet programme planned. (b) Bury – Won the Longman Cup in 2009, significant levelling of lawns has had problems with weather, but expected to be ready for 2010. (c) Chester – Membership now 86, installed new electricity supply, very active coaching programme, developing Advance team for 2010 Jamboree. (d) Culcheth – Finished 2nd in Golf League, despite low membership have run many corporate events, now have four Golf Coaches, Winter Mat still available. (e) Fylde – New lawn now in use, Betty Bates won the All England Handicap, have increased range of equipment. (f) Isle of Man – Development restricted by illness of major players, lost facilities at Port St Mary due to low membership, hosting many corporate events . (g) Liverpool – Forced to change location, low membership, will continue till next Summer to develop a Croquet facility in Liverpool. (h) Llanfairfechan – Opened an excellent new clubhouse, won first trophy in history – Short League, membership now 88, saddened by four bereavements. (i) Pendle – Professional Greenkeeper appointed, new lawn drainage, won Secretary’s Shield and Handicap League, very active programme on lawns. (j) Penrith & N Lakes – membership increasing slowly, purchased new Lawn Mower, brought additional lawn into use, had successful club competitions. (k) Southport – Lawns much improved, expensive advertising generated 19 new members, new CCTV and broadband installed, new storage shed ordered. (l) Westmorland – Membership 23, will have 2 full lawns for 2010, recruitment drive planned, with Crake Valley will play in 2010 Midweek and Handicap Leagues. 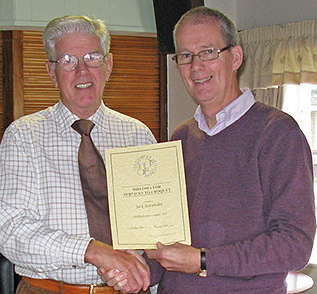 Chairman David Barrett presented Llanfairfechan Chairman, Jack Pattenden, with a CA Diploma for Services to Croquet. This was followed by presentation of league trophies to league winners: Bowdon Saints (Advanced League); Pendle & Craven (Handicap League); Bowdon Earls (Midweek League); Llanfairfechan (Short League); Southport (Golf League).